Do APIs Make The Mobile App Development Process Quicker & Easier? The user’s curiosity for knowing the basic idea revolving around the working of various things and devices should never come to an end, as the technologies are changing day by day without letting them learn the complete process of the previous one. Let us prove the myth of every user about technology that there is always something new stuff inside a new technology by bringing out some impressive evidence. To be very true, there is no new business in the market but everything is based only upon the research made by an individual or a group of people. In other words, someone had already written these concepts during his research in ancient times. Similarly, it is the concept of APIs, it’s nothing new, but it is faster and advanced concept. An API is defined as Application Programming Interface having a set of routines that allows the developer to share all the assets between two applications. An application could be defined as software based on the concept of an algorithm that takes some input and generates an output by following the basic algorithm on it. Programming refers to the process of developing an application in computer language depending upon the platform utilized by the developer. It also enables the user of the application to access the data from another application, database or software. Interface refers to the user interface that makes it enable for the users to access the different features of an application like logging in, making a selection and making out the payments in three steps only. How do APIs Make Developers’ Life Easier? API enables the users to access the database of another application, ethically and hence allowing the user to read as well as write the accessed data as per the requirements of the type of applications being used by him. API enables for one app to communicate with another application by avoiding all sorts of interruption in between and hence, making the working of the application much smoother on variant platforms that includes wearable like earphones, web or mobile. The developers or the applicants may utilize the APIs of the previously existing applications having a huge user database as these sorts of applications may easily provide the detailing of the user behavior. API behavior remains the same with every sort of irrespective of the type of the devices or the OS on which the device has been executing upon. Thus, making the interface of the applications to be universal as well as it also avoids all sorts of misunderstanding while accessing data from third party server. Public: These Public APIs are made available to the developers or the mobile app development companies as an open source to developing their applications. For an instance: the Apple store has APIs Carbon. Partner: These APIs are utilized by the third parties for generating the revenue and for exercising the quality control. For instance: the ride-sharing apps. Through these aforementioned 5 ways the API has given mobile app development companies a great chance to attain a great concentration over the basic idea of an application instead of focusing upon the detailing of the mobile app including login and payments. Thus, using the API, the Android or iOS developer may focus upon developing the application and can utilize the experts’ knowledge for detailing the application in an easier way. 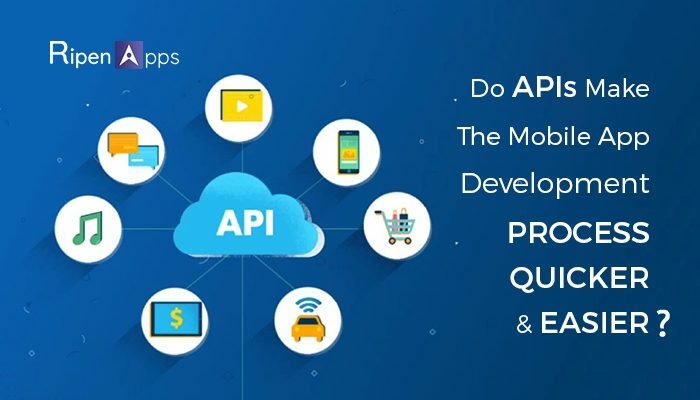 The utilization of API has given all the mobile app development companies a broader or a stretched way to extend their market of the application by developing the innovative applications for their customers. By using the concept of APIs, the developers’ only need to concentrate on the basic idea of application and all details could be done through these APIs easily.